Caffé Vittoria is something of Boston institution, or certainly a North End institution (the North End being the Italian part of town). It’s an old-fashioned Italian Café, with heritage dating back to 1929. Spread over three floors, with four seating areas, I’ve only ever visited during the day, when just the ground floor café is open. At night it becomes more of a bar than a café, although the menus stay the same throughout the day, serving coffee, drinks, pastries and ice-cream. As a day-time café, it trades on my sense of nostalgia as much as anything else; waitress service, a menu that is delightfully concise and to the point, and all with certain air of opulence. A real touch of old Italian class. It helps that the coffee is reliably good and, being an old-fashioned Italian espresso man myself, it very much hits the spot. The pastries, by the way, are divine. If you want something a little different from the typical American coffee shop, then Caffé Vittoria is the place to go. For me, no trip to Boston would be complete without popping in for an espresso. Of course, this being America, there has to be a television in the corner showing SportsCenter with the sound turned down, while Frank Sinatra somewhat incongruously croons quietly in the background. That said, my favourite Italian espresso bar in London, Bar Italia, has a TV at the back, but at least that’s tuned to an Italian TV channel. Caffé Vittoria is long and thin and the layout is pretty simple: there’s a pair of bay windows either side of the recessed door, each with a highly-prized table where you can sit and watch the world go by on Hanover Street. The marble-topped bar runs almost the full length of the right-hand side while a row of small, round tables, each with four chairs, runs up the left-hand side. At the back, where I like to sit, things open out a bit, but it’s not exactly spacious. 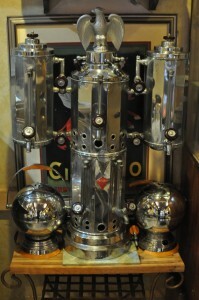 Given the preponderance of old-fashioned coffee-making paraphernalia, including an old cylinder machine in pride of place on the bar as you come in, the actual espresso is made with a pair of fairly modern range-style machines. These days Caffé Vittoria serves Lavazza coffee and, while there’s nothing wrong with that, the purest in me was rather hoping that it was going to be a house blend, roasted in small batches by an old Italian family who’d lived in the area for generations. That said, the espresso I had hit the spot. My only complaint is that it could have been a bit shorter, but I find myself saying that a lot in American establishments. Caffé Vittoria is refreshingly one-sized fits all when it comes to its drinks: there is no small, medium or large (or, heaven forbid, mock-Italian sounding names for the sizes). If coffee’s not your thing, there’s hot chocolate, a wide selection of tea and a range of Italian sodas. There’s also a well-stocked bar, with liqueurs, spirits and wine and, of course, some very tempting Italian pastries and ice-cream. Very tempting indeed. This entry was posted in Boston, Cafes, Cake, Evening Opening, Late Opening and tagged include by Brian Williams. Bookmark the permalink.